Home Lifestyle GREENWICH: Pizza Making Camp – I am now a Certified Pizza Maker! GREENWICH: Pizza Making Camp – I am now a Certified Pizza Maker! Spent a delightful Wednesday evening with the dashing members of Davao Bloggers Society for a fun Pizza Making activity with the Greenwich associates in their newly renovated branch fronting Gaisano South Mall at Ilustre corner Duterte Streets. A food making camp which allowed us to make our own pizza and become a certified pizza maker. The session started with a brief introduction by the Trade Marketing for Mindanao, Mr. Alvin Tolentino, on how Greenwich Pizza made its way to become one of today’s biggest food chains in the Philippines, starting with just a small store in Greenhills and can now be found everywhere in the country. After the small talk, we’re able to witness how Greenwich Pizza prepares their dough before putting all the other necessary ingredients. After which, the dough was distributed so we could start creating our own pizza. Since we didn’t have aprons, we just draped ourselves with cute smiles and clean hands. Greenwich Pizza distributed to each attendee, a round dough with small bowls of cheddar and mozzarella cheeses, pineapple chunks and onion rings, beef bar to pinch and bacon flakes, pizza sauce and other toppings needed. On my dough canvas, I smoothly spread the pizza sauce from the center, leaving a clean inch around the outer part of the dough. Sprinkled some mozzarella cheese and proceeded to add the remaining ingredients. Although there were no set strict guidelines to follow, I managed to put the bell pepper, pepperoni and ham in a more organized fashion. I then covered the whole dough with lots and lots of cheese. The team from Greenwich gathered all our pizzas for baking and at the same time, judged our work, if we did everything right. 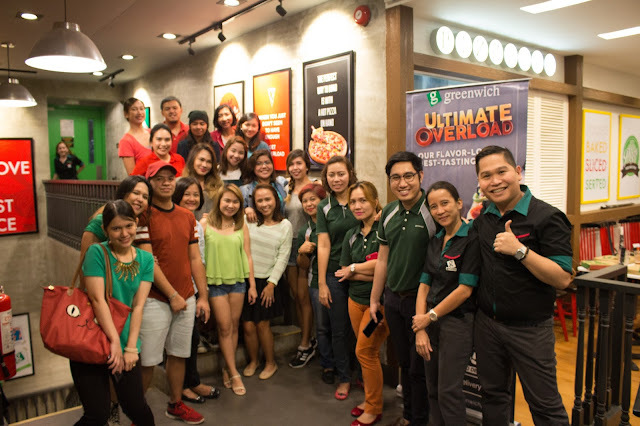 After minutes of waiting, baked pizzas were then brought out to be eaten and already judged by Mr. Alvin and some of the Greenwich staff. Before announcing the winners, freebies were given away via a raffle draw. Cheers to that! And when the time came to the announcement of the best pizza, imagine my surprise when out of more than 20 bloggers who joined, I was one of the four Top Pizza Makers! Isn’t that amazing? Watch this video below to see the rest of the happenings during my first Greenwich Pizza Making Camp! Enjoy!